The crew of ‘Rescue 193,’ 771 Squadron, RNAS Culdrose, was presented with the Edward and Maisie Lewis Award by the Society’s Patron, HRH The Princess Royal. The crew members were Kapitänleutnant Steffen Volkwein FGN (Pilot and Aircraft Commander), Lieutenant Paul Smalley RN (Co-pilot), Lieutenant Commander Paul Robertson RN (Observer and Winch Operator) and Petty Officer Mark Richardson (Aircrewman and Winchman). On 3 November 2013, the crew took part in the gallant rescue of five fishermen from sinking French fishing vessel ‘Panamera’ in atrocious conditions, battling high winds in near complete darkness and with no visible horizon. This was made worse by the failure of their aircraft’s floodlights and a language barrier between the French fishermen and the English speaking air crew. Despite these problems and with only a couple of minutes of time left afloat towards the end of the rescue, the crew managed to get all five fishermen safely to shore uninjured. The Charity’s Skill and Gallantry Awards took place on Tuesday 7 October at Fishmongers’ Hall in London. HRH The Princess Royal attended the ceremony and presented the awards. Currently in its 175th year the Charity still recognises the hard work and bravery demonstrated by those who dedicate their lives to protecting Britain’s seafarers. On 27 October 2013, a crew of seven led by Legendre took part in a search for a missing boy in severe conditions, west of the Newhaven breakwater. The team battled four to five metre breaking waves and poor visibility, which was made worse by the approaching darkness. The extensive damage sustained by the lifeboat was an indication of the conditions the crew faced during the search. On 19 September 2013, Derek Pusey took part in the rescue of two men who were cut off by the tide and in danger of being swept out to sea. The casualties were stranded high up on a ledge amongst steep rocks. Having assessed the safest way of retrieving the two men with Helmsman Len Walters, Pusey skilfully steered his lifeboat into a narrow gully within the rocks. Manoeuvrability within this confined area was extremely difficult due to the turbulent sea. With the help of Crewman Clive Williams, Pusey separately transported the casualties over to a second and larger lifeboat. This manoeuvre had to be repeated three times until both casualties and Williams were safely on board the other lifeboat. At one stage during the rescue, a powerful wave broke over the reef pushing the lifeboat towards the cliffs with significant force. Pusey managed to regain control and rapidly return the second casualty to safety. Throughout the challenging rescue, Helmsman Pusey and the other crew members battled a high tide and breaking waves in darkness. His judgement, skill, and exemplary teamwork are now being recognised with this prestigious award from the Shipwrecked Mariners’ Society. Petty Officer Aircrewman Russell Adams, based at Culdrose, received an Individual Commendation from the Society’s Patron HRH The Princess Royal, for his courage, stamina and fearless determination during an air/sea rescue off the North Cornwall Coast. During the rescue on 1 February 2014, Adams retrieved five French fishermen from the sea shortly before their vessel, ‘Le Sillon’, was wrecked. He battled significant spray, thirty foot seas and at one stage was fully submerged beneath a particularly large wave. After the third recovery the helicopter Observer noted that despite being exhausted and vomiting, having ingested sea water, Adams was immediately preparing himself to be lowered again. His professionalism continued on the short flight back as he cared for the survivors, monitoring them for the effects of cold and shock. 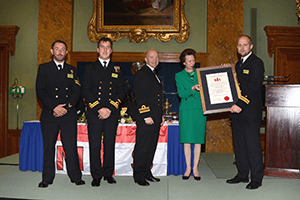 Adams demonstrated outstanding courage, willpower and skill during the rescue for which he is being awarded this prestigious commendation by the Shipwrecked Mariners’ Society. 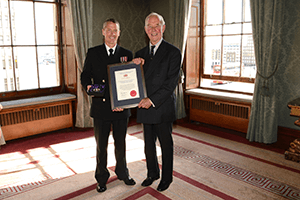 Volunteer Crewman Clive Williams, based in Cardigan, was awarded an Individual Commendation by the Society’s Patron, HRH The Princess Royal, for his courage and determination. On 19 September 2013, Williams assisted in the rescue of two men who were stranded by the tide and in danger of being swept out to sea. Williams’ initial task was to swim to the casualties and assess their situation. Reaching them was physically demanding; the cliff face obscured the light from the moon and he was frequently pushed under water by the breaking waves. After being knocked from the rocks several times, Williams managed to get ashore. Having reached the men, it was clear that they were unable to enter the water. Both were over sixty years of age, cold and distressed. Williams equipped them with lifejackets and offered reassurance while they waited to be recovered by the lifeboat.